The TRUE evil has come forth. Forget Sauron, forget Satan, forget Todd McFarlane, hell, forget Barbara Streissand - Makuta has risen, and he will destroy all in his path. Stepping away from the story, the figure is very impressive - Makuta is a suitably huge evil, something of a larger version of the Rahkshi [his first incarnation, in Lego's online game, was the small black villager seen above --ed.]. This is definitely a good thing, as the big baddy looks awesome on display with his disciples. Standing 9 1/2" tall, Makuta is a big figure, and he's not as easy to build as the Bionicles that came before him: Makuta comes in 199 pieces with a thick instruction booklet and he'll take some time to put together, but it's a rewarding experience. Once he's in one evil piece, he's just as big as the Dark Lord Sauron and his enormous double-bladed scythe is more than a match for that poncy little mallet the Dark Lord plays with. 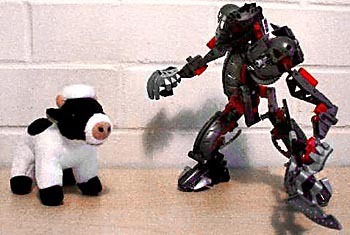 I'm glad Lego kept away from the past big evil figures/toys they've done for Bionicle - things like enormous satanic mosquitoes and gigantic evil chickens don't work nearly as well as big mechs like Makuta. Keeping in the spirit of the line, Makuta is mostly mechanical, with dark metals and reds emblazoning his hulking body, and a new mask to hide his face. The mask is actually very cool - his ball jointed neck means that his mask has two faces, and turning his head around reveals the other face - it's up to you which one you have him displayed with. He has some other neat features on his well-designed body, including big robotic shoulders to make the most brain-dead American Footballer blush and a cool pipe through his midsection attaching to his clanking big arms. The backs of his legs even have moving metal blades, just for a bit of variety. Makuta has some of the best articulation ever seen in the Bionicle line - his arms, elbows, wrists and neck are ball jointed with the common Lego ball joint that we've seen with all of the past Bionicle toys, where his legs have a different kind of movement all together - his legs have the same movement as a ball joint but "click" together when moved, then becoming stiff, keeping him stable and standing in position. It's hard to explain, but it works effectively to give him the best in both poseability and stability. He's missing knee joints, but with the design on his legs they wouldn't have served any purpose except to make him taller, which isn't needed. Makuta also has movement at the waist, but it's part of an action feature which represents the action feature from the Rahkshi on a larger scale. Turning the knob on the back of Makuta makes him swing his big nasty double bladed scythe at an enemy, killing it instantly. 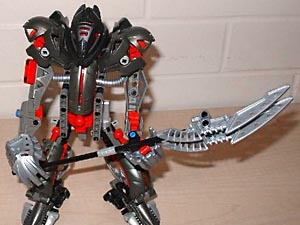 The big scythe is over 10" long and is threatening even outside of the Bionicle world - other toys will cower in fear! The twisting strike is an effective action feature, although it slightly limits the poseability of Makuta, taking away that point of articulation at the midsection. But it's a lot of fun to have Makuta bash at Sauron, or the Toa, or all kinds of other toys, and I love his scythe. 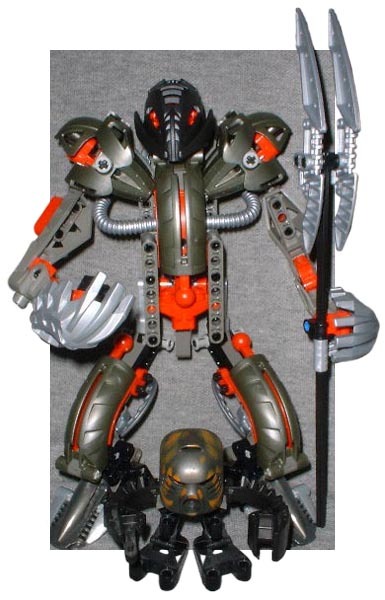 His legs and midsection also have places for Bionicle slugs, three in fact, which can open to have them fire out at his enemies, just like the Rahkshi. These aren't included, unfortunately, but purchasing one of the kraata containers gives you the extras you need - non-Bionicle collectors can skip this optional extra if they've just picked up Makuta as a cool mech toy. And indeed they should - Makuta is one of the coolest new toys I've seen this year, big and hulking and scary, a perfect addition to the Bionicle line. He's not as expensive as Takanuva (one of the other Bionicle boxed sets just released) and makes for value for money. 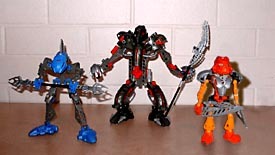 Once again, the fine folk at Lego have outdone themselves with the latest in the Bionicle line - Makuta is awesome, as with the Rahkshi and Toa Nuva, and well worth a purchase. Would you believe us if we told you that big scythe was really a hockey stick? How about a humongous fork? Tell us on our message board, the Loafing Lounge.